Ben Lawers - Britain's tenth highest peak - dominates the picture postcard scene of Loch Tay when viewed from Kenmore and, on a clear day, provides an awesome perch from which most of Scotland can be seen unfolding around you. This particular hill benefits - or rather suffers (depending on your point of view) - from a visitor centre built on the unclassified road between the A827 Loch Tay road and Glen Lyon to the north. Because of its blissful situation high above the gently curving loch, this is always going to be a popular destination for walkers and the centre simply adds to this. 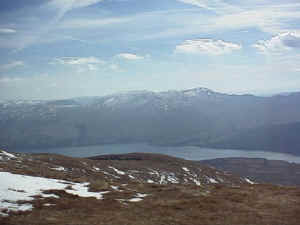 Ben Lawers is, therefore, never a place for those looking for solitude, except in all but the most testing conditions. On the other hand, the small revenue generated by the centre is put to good use by conservationists who are at least attempting to make sure that too much tourist erosion does not take place. So, for the purpose of this walk, we will follow the wishes of the National Trust for Scotland, who own the mountain, and tackle the 3983 foot peak via its 3619 foot neighbour, Beinn Ghlas. Leaving your transport in the ample car park at the centre, follow the wooden walkway which splits in two with one branch signposted as a nature trail and the other one indicating the path for Ben Lawers. A glance over your left shoulder at this point will reveal the dizzying heights of Meall nan Tarmachan which is a wonderfully rough and rocky alternative to the grassy plains of Beinn Ghlas ahead. The obvious path follows the line of the burn, passing some shielings, and continues up steepening slopes before becoming a zig-zag to allow height to be gained more earnestly. The way flattens out before the final stiff pull to the summit of Beinn Ghlas which provides a tantalising view of the day's destination to the north east. 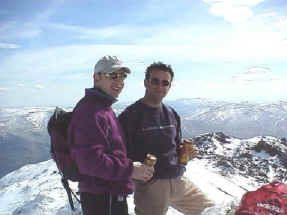 Unfortunately, some of your hard-earned height has to be lost dropping down from the summit into the col between Ghlas and its illustrious neighbour but at least your legs and lungs will enjoy the break before tackling the imposing eastern face of Ben Lawers. Work to combat erosion on the broken granite upper reaches of the mountain is obvious as you make the slog through the schist to the top with its trig point and stone cairn. As the saying goes, ''the De'il is good to his ane'', and we were blessed with a particularly gorgeous April day on which to make this trip. The vista from the summit down to the glass-like Loch Tay was matched by a similarly serene view of Lochan nan Cat at the foot of Meall Garbh. Hikers who have managed to leave a car in the tiny hamlet of Lawers can continue their adventure by following the ridge to Creag an Fhithic and then bagging An Stuic before continuing over Meall Garbh and Meall Greigh to complete a worthy five Munro expedition. But as we have just the one vehicle we turned tail and picked our way carefully down the snowy slopes back to the col before climbing back up Beinn Ghlas, resisting the temptation to cross over to Meall Corranaich in favour of a pint at Scotland's oldest inn, down at Kenmore. 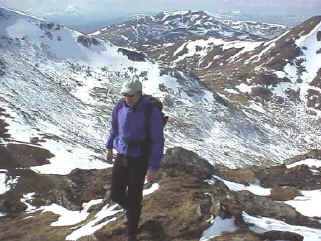 Distance 5 miles/8km (or 11 miles/17km taking in An Stuc, Meall Garbh and Meall Greigh). Maps OS Landranger sheet 51 or Harveys Ben Lawers. Start/parking Ben Lawers visitor centre. GR: 609380. Grading A fairly easy trek until the upper reaches of Beinn Ghlas are approached. Suitable for fit adults and older children. At almost 4,000 feet above sea level the summit of Ben Lawers should never be underestimated even on an apparently good day. Full weather and navigational equipment must be carried at all times.